Gulf Dunes Resort, unit 108 is a beautiful beachfront, 3 bedroom condo with a direct ocean view. The private balcony of Gulf Dunes Resort, unit 108 faces the ocean (Gulf of Mexico). 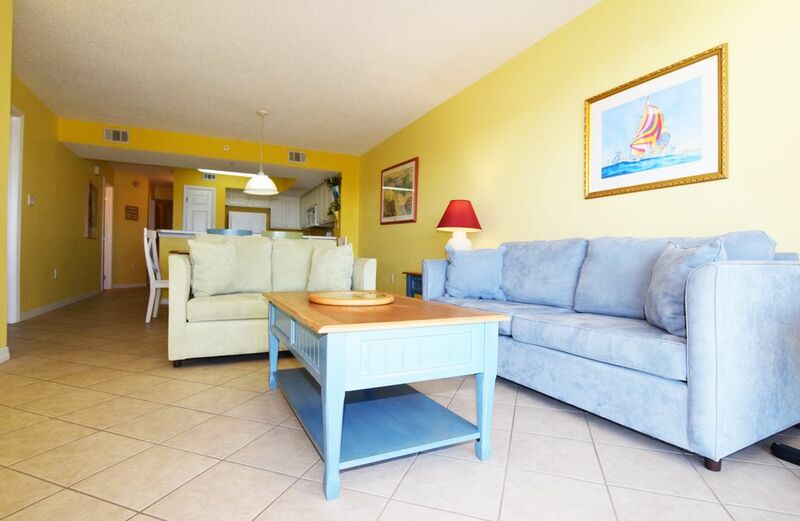 Gulf Dunes Resort, unit 108 comes complete with bunk beds, a full kitchen, 2 bath, living and dining area, Standard Sofa and Love Seat, Cable TV, WiFi, and much more. Gulf Dunes Resort, unit 108 is located above the covered parking area and has a clear view of the ocean, beach, dunes, and pool. Though Destin and its many attractions are only a short drive away, this stretch of Powder White Beach is much more Private. You will enjoy your space in the sand without all of the crowds and noise. Included with this rental, is one set of beach chairs and umbrella,, WiFi connection, and HD TV. This Beach Front Property is accented with Tennis Courts, a Private Gym, two Seasonally Heated Pools, and Protected Natural Dunes. There is 426 feet of Gulf Front Privacy, two private Dune walkovers with showers, and Relaxing lush tropical landscaping. Though Destin and its attractions are only a short drive away, this stretch of Powder White Beach is much more secluded. Okaloosa Island is conveniently located 1 mile from the New Convention Center, one mile from Fort Walton, and only six gorgeous miles from Destin. Enjoy breathtaking Sunrises and Sunsets from one of the Cleanest and Most Unspoiled Beaches in all of Florida. Last Minute Deals are available. WE HAVE SEVERAL PROPERTIES TO CHOOSE FROM. PLEASE INQUIRE TO SEE ALL AVAILABLE OPTIONS. Perfect location - wonderful vacation! This unit is wonderful! It was clean upon arrival and was equipped with everything we needed. Comfortable beds and furniture. Staff was friendly and attentive when we needed help on a few very minor things. Highly recommend this location! We all loved being right on the beach. The complimentary beach chairs and umbrella were an added bonus. When kids got tired of the beach they went up and swam in the heated pool. White sandy beach and blue ocean is some of the most beautiful I have ever seen! Will definitely book again! Condo needs just a little TLC and it’s perfect! Loved Fort Walton Beach!! Thank you Gulf Dunes for an awesome family vacation! Clean, spacious, family friendly, and has a wonderful view!! Condo was clean and beds were comfortable. We had a wonderful view of the gulf and it was only steps away as well. It was very kid friendly which was a must for our family! I was worried with a condo we would get a lot of noises from other units (we have only rented houses in the past) but this was not the case, it was extremely quiet. We had a wonderful time and would highly recommend this location! We've stayed at Gulf Dunes several times and this is one of the nicest units we've had. Very comfortable furniture and well appointed kitchen. Great place to stay for a fun beach vacation. Unit 108 had all the staples and proved a comfortable place to stay. No bells or whistles but the beds were cozy and the balcony was perfect for relaxing. Our family with two young children had a great time.